Euro zone worried: Could Rising Italian Pressures Spillover to Europe? After two months of negotiations, the Italian 2019 budget deficit target of 2.4% of GDP is larger than the previous official target of 0.8% and larger than the 1.6% provisionally agreed between Finance Minister Tria and the EU. 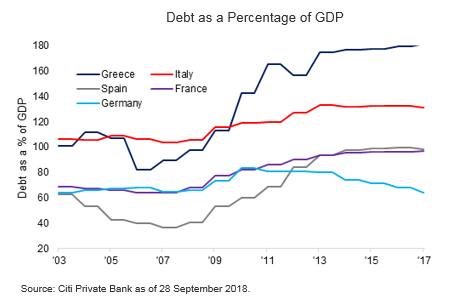 Debt sustainability and a weak bank sector are challenges as economic growth remains sluggish: Italy's debt to GDP ratio of 132% is one of the highest in Europe, and is not likely to be reduced anytime soon without less fiscal spending. It is concerning that this budget is skewed towards higher public spending (€9 billion to pay for M5S's citizenship income, €2.5 billion to pay for earlier retirements, and €1.5 billion to compensate bailed-in bank bondholders), ahead of tax rate reductions in 2020, in a country which already has the second-highest pension spending to GDP ratio in the EU. For broader Europe, Citi Analysts view the recent equity market weakness, on the back of the Italian fiscal news, as decent entry points. As we saw back in May following the formation of the new Italian coalition, broader European equities rallied 3.5% in the subsequent 10 trading days, having fallen over 5% in the previous week. The two Italian risks that could eventually impact on the rest of Europe – a move towards a Eurozone referendum and a systemic banking crisis as the NPLs' of over €250 billion get exposed by a sharply weakening economy – are not immediate threats. Europe ex-UK equities continue to be overweighted, well supported by strong earnings growth. Within the region, Citi Analysts continue to favor French and Swiss equities, as well as the banking sector.